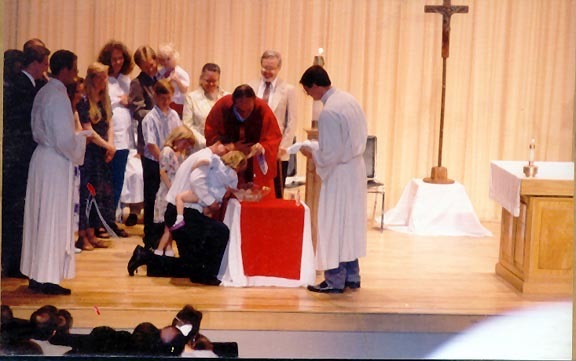 Pentecost Sunday 1995 our family of six along with friend Rob Corzine entered the Catholic Church with tears and new friends. We lost all of our Evangelical friends within two weeks but it was a small price to pay. 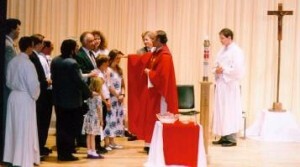 Here you can see two pictures of that momentous day — our family on May 22, 1994 at Christ the King in Ann Arbor Michigan. 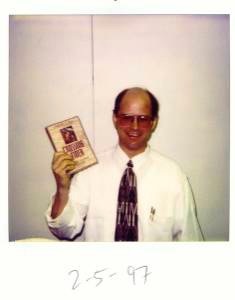 Below is a picture of me holding the first copy of my conversion story Crossing the Tiber in 1997. I always say that when I was 17 years old Jesus introduced himself to me; when I turned 39 he decided it was finally time to introduce me to his family. You can read the short version of conversion story here with lots of pictures. When we joined the Church it was Janet, me and our four kids. Now our family has grown to 23 of us! Thanks everyone for the great welcome and the marvelous family!